This Info Note aims to present a summary of results from gender-related activities at the CSVs in West Africa. The gender mainstreaming included the capacity building of implementation team, the empowerment of women with gender sensitive activities and the understanding of gender perception on climate change and adaptation strategies. Ouedraogo M, Partey ST, Zougmore R, Derigubah M, Sanogo D, Boureima M. 2018. 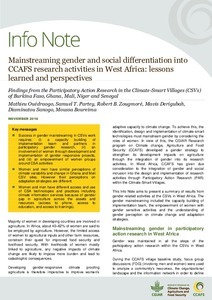 Mainstreaming gender and social differentiation into CCAFS research activities in West Africa: lessons learned and perspectives. CCAFS Info Note. Wageningen, the Netherlands: CGIAR Research Program on Climate Change, Agriculture and Food Security (CCAFS).